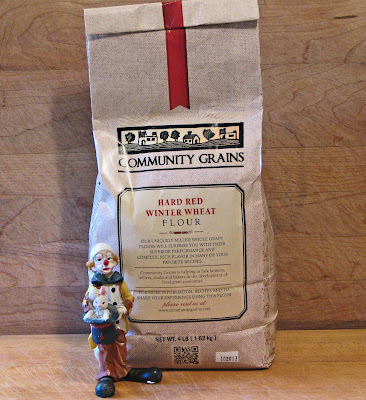 Community Grains grows and mills a very special whole grain flour. 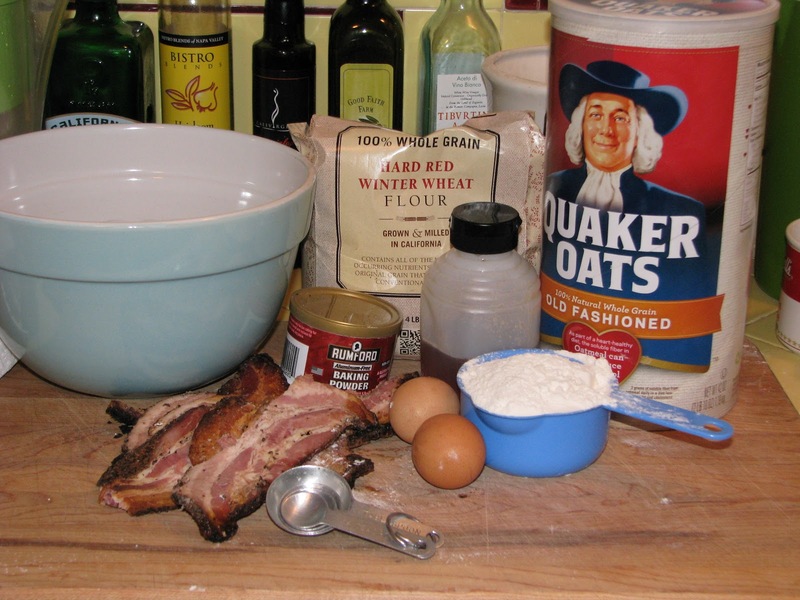 This flour contains all the natural nutrients that are in the original grain that are lost with conventional milling. One hundred percent of the germ, bran and endosperm are included in this flour. With conventional milling the three components are separated and if whole wheat flour is desired these parts are reconstituted. This grain is local, grown in the Woodland California area. The health benefits of whole wheat flour are superior to your standard white flour. 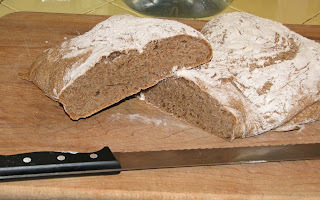 Whole wheat flour performs differently than all purpose flour so adjustments to recipes will be necessary. Today we are making Ciabatta bread. We are using the recipe from the Community Grain website. Here is the recipe we used. 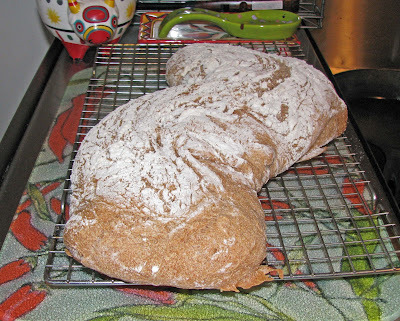 The process of baking bread is a special experience. The proofing of the yeast, the kneading of the dough, the rising, the wonderful smells of baking and ultimately eating your creation cannot be experienced by words alone. 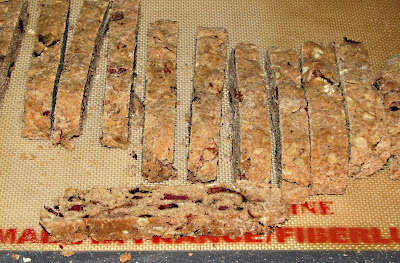 This recipe uses a lot of water and can be challenging. This dough is sticky and a little difficult to manage. The end results are worth the effort. Our bread was delicious. 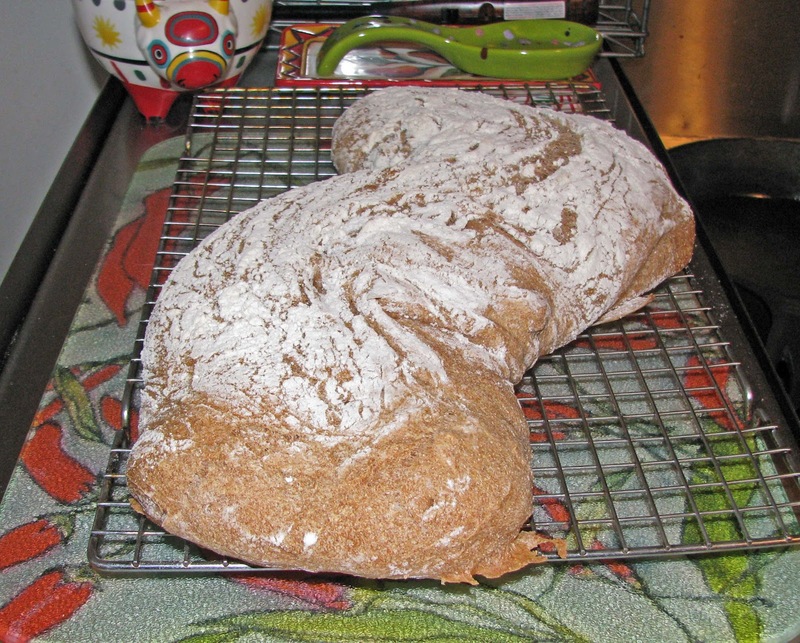 It had a nutty flavor that made this bread special. Our bread did not have the large round air pockets inside the crust like the videos results. I believe that I did not mix the initial dough long enough in the mixer to form gluten. I am not the best example of following instructions. Still this bread was a success. 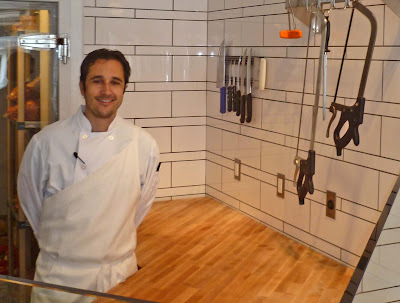 Creating and experiencing fresh bread is what it is all about. 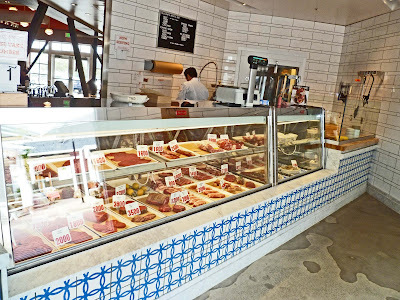 We are extending an olive branch to the Mad Meat Genius readers. This branch is laden with cured olives. Yes, you read correctly, cured olives. 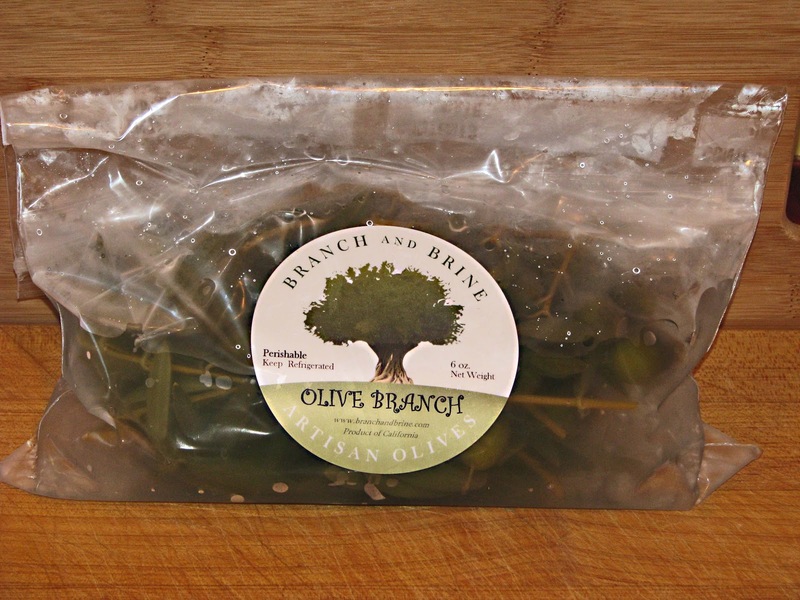 ‘Branch & Brine’ has taken Manzanillo olives that are still on the branch and brined them with a salty solution. The leaves remain fresh and the olives are a tasty treat. This fun and novel approach to cured olives would make a great presentation to your plate. I just love eating these little salty green orbs. The olives come in a double wrapped resealable Ziploc bag for easy storage. 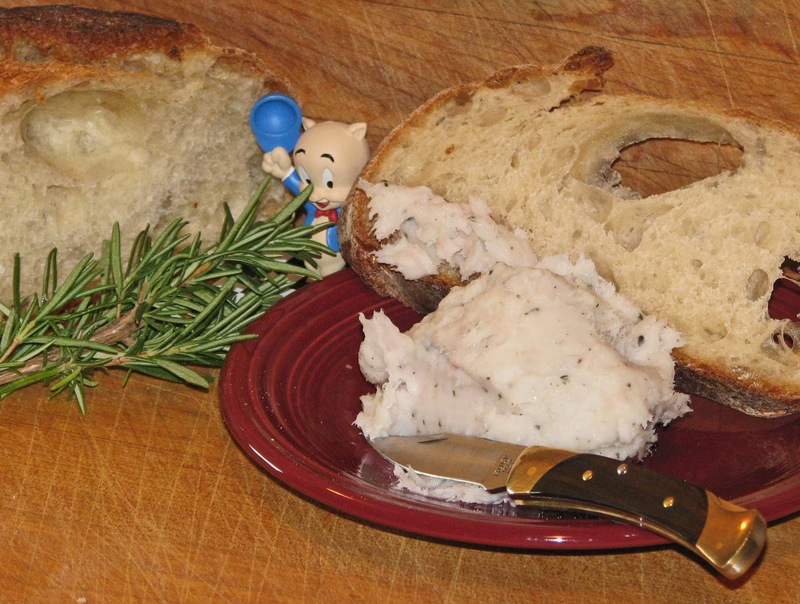 They can be found at the Santa Rosa farmers market or you can order directly from ‘Branch & Brine’. 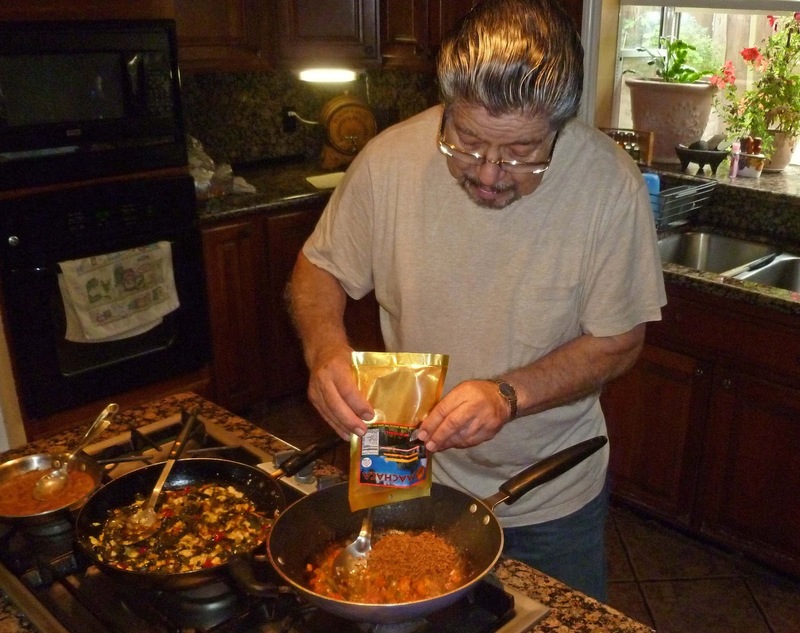 We are going to revisit and once again try the dish Carne Machaca. 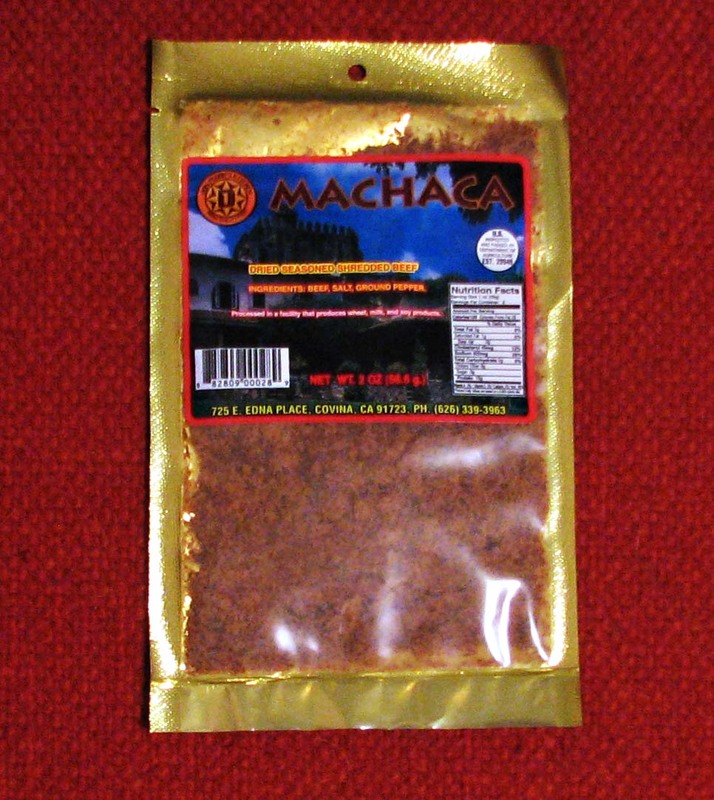 Machaca is a dried beef product that has been marinated, cooked, dried and shredded. Our last experience with Machaca the results were less than stellar. Salty, with a funky off putting odor was a little too much. Andres Jaramillo, President of ‘Don Pedro’s Meat’ offered us a sample of Machaca that he produced. 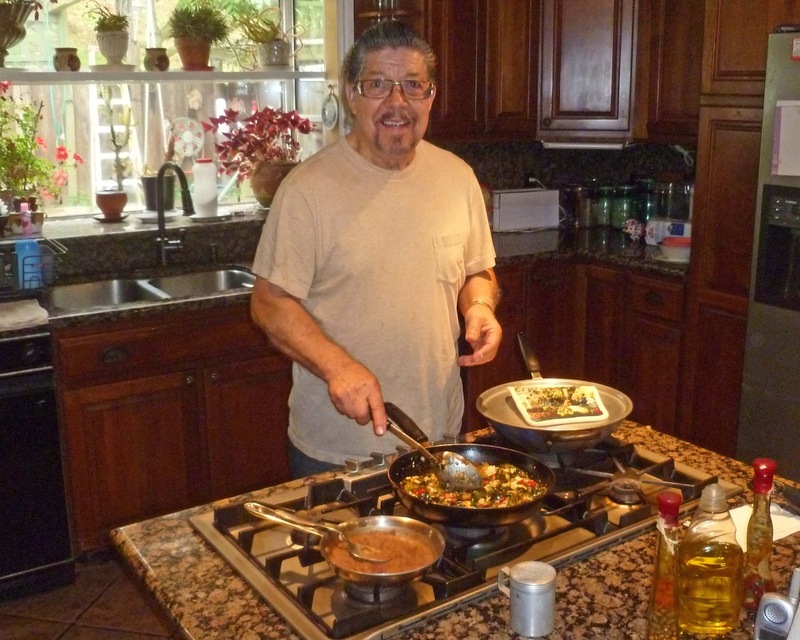 He claims that his popular Machaca was made with lean beef, salt & pepper, slow cooked and dried. We took him up on his offer and will try this beloved Mexican dish again. I am bringing out a secret weapon this endeavor. 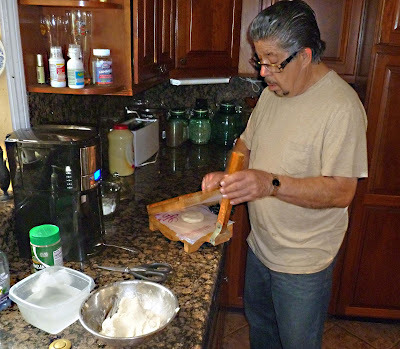 Ray, my friend and accomplished Chef will be making us breakfast with our Machaca. 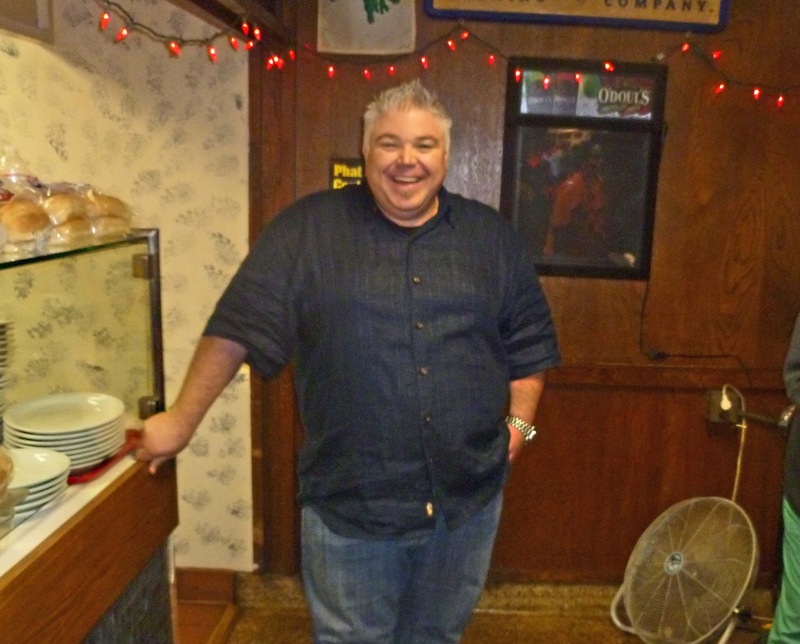 He used to own the very popular Mexican restaurant ‘Margaritas’ in Martinez California. This should be a very tasty experiment. 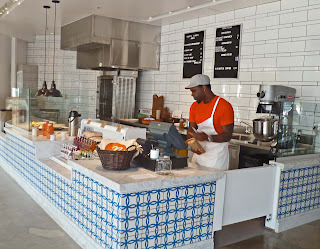 When I walked into Ray’s kitchen the aromas were intoxicating. 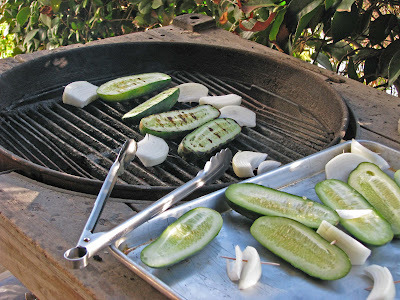 The smell of fresh tortillas on the grill and onions and peppers cooking made me swoon with anticipation. We were going to cook the Machaca with sautéed onions, jalapeno peppers, tomatoes and eggs. We cut open the package of Machaca and took a whiff. It was very pleasant smelling. It smelled of dried beef. It was chopped very finely almost to a powder consistency. We took a little pinch and gave it a try. It was tasty with a beefy flavor. It was on the salty side straight out of the package. Ray sautéed the onions/tomato mixture until it was soft and fragrant. We then added the whole package of Machaca. We later found out that we only needed to use several tablespoons. The mixture was cooked for several minutes before we added beaten eggs. No additional salt was added. Several more minutes of cooking and our breakfast was ready. Home made fresh tortillas, salsa, a cheese & pasilla chile dish, refried beans and our star ‘Huevos con Macha’ lined our breakfast table. A tortilla was our canvas. The painting consisted of a scoop of our Machaca and egg mixture with a little dab of salsa. This was dish was an outstanding success. It smelled heavenly. A deep rich beef flavor permeated our egg mixture. The level of salt was perfect and accented the other ingredients. Because this beef was chopped so finely it practically melted and became one with the eggs. The peppers and salsa was warming. This was a comforting breakfast. The fresh tortillas with Machaca eggs have made me a convert. Ray is one hell of a cook. Is it okay to take a siesta right after eating breakfast? 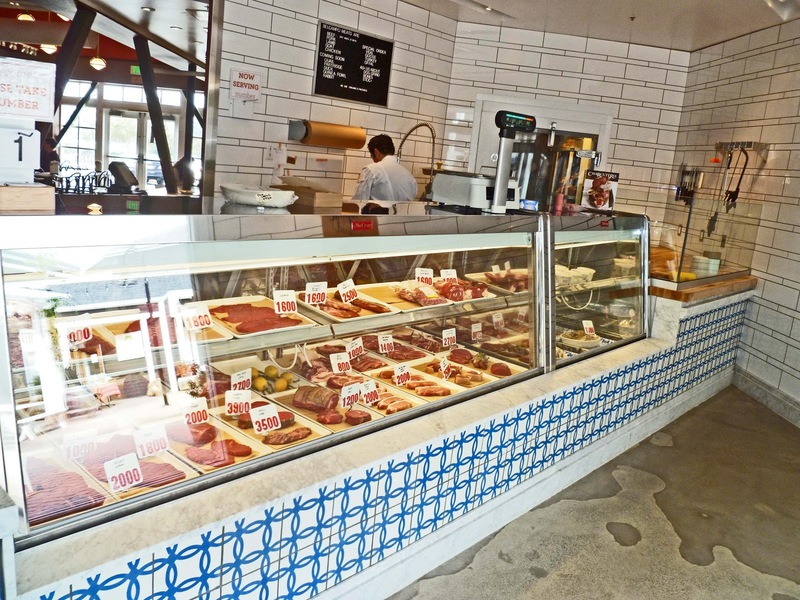 Don Pedro’s Meats is located in Southern California. 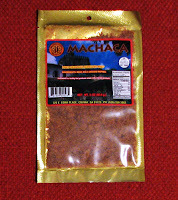 They not only make Machaca but other Jerky’s, dried meats, chorizo and salsas. 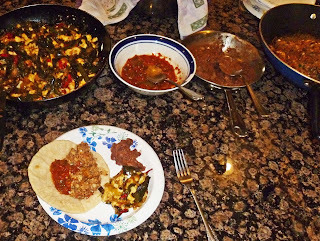 Thanks to Andres Jaramillo for introducing us to some great tasting Machaca. Thanks to Chef Ray for being a great friend and cook. Romanesco cauliflower, broccoli, Monsanto experiment gone awry or delicious Italian heirloom vegetable will be on the barbeque today. 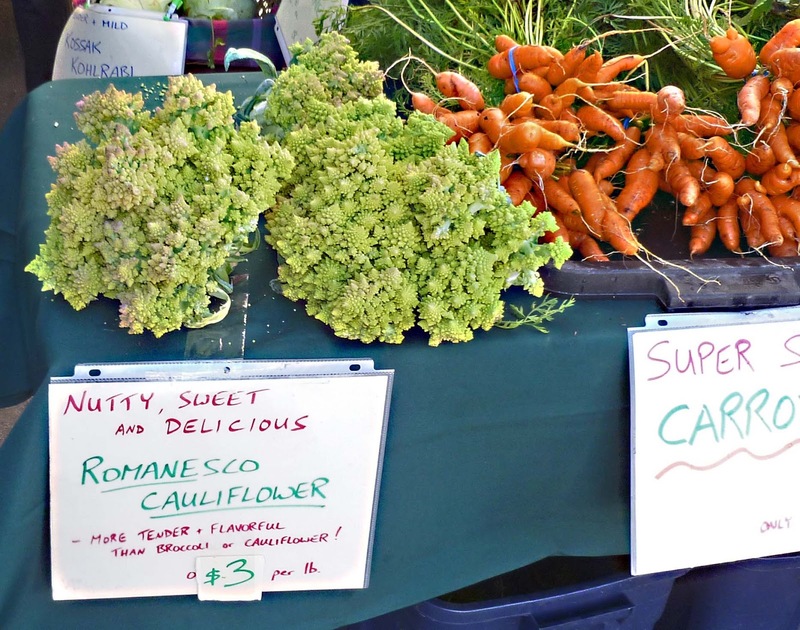 This vegetable is referred to as a cauliflower and or broccoli at the same time. It is apple green and looks like a moon rock or craggily corral from under the sea. 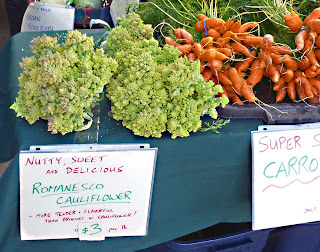 This vegetable is an eye catcher which grabbed us at the Santa Rosa farmers market. We talked to the farmer and asked his advice on cooking this spiraling, whirling, crater, nub studded vegetable. He said he would take a whole head and roast it in the oven. This was a no brainer. My oven will be a custom barbeque fueled by smoking hot mesquite charcoal. We only bought ½ head which weighed out to 1 ½ pound. The preparation was simple. A slight mist of olive oil and a sprinkling of coarse sea salt covered our Romanesco. A small cast iron pan cradled this creature to protect it from direct fire. 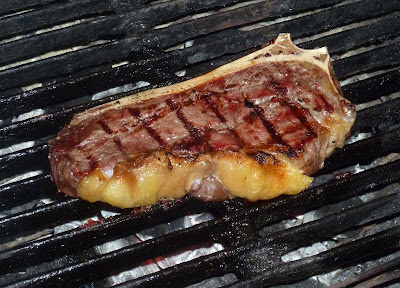 Our barbeque acts like an oven. We can control the temperature with accuracy by the position of the vents. If you were to use a home oven, I would suggest a temperature of 400 degrees. We roasted our cauliflower for 30 minutes. 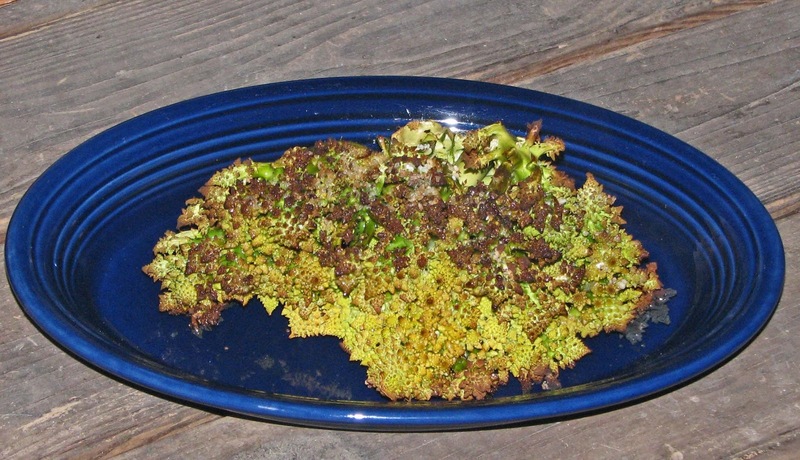 When we removed the broccoli the nubs had crisped and browned to a crispy texture. We took some scissors and trimmed the stalks from the stems. We cooked our Romanesco cauliflower so it still had a crunch and still a little chewy to the bite. The browned nubs were sweet and crunchy. The stalks had a pleasant nutty flavor. This was a vegetable packed full of flavor. It did have the flavors and textures of both a cauliflower and broccoli. What a fun and scary looking vegetable. This is produce that I definitely will purchase again. 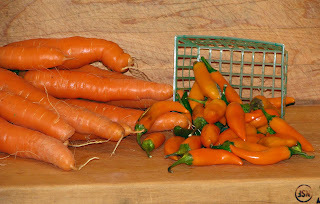 The Bulgarian carrot chile is an eye catching chile. Its shape and color mimics a ‘Bugs Bunny’ prop that we all love. 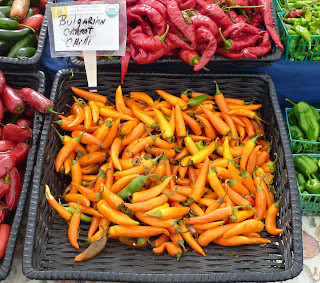 These peppers were found at the ‘Santa Rosa Farmer’s market. When I find new or unusual peppers, a hot sauce is one way to sample its heat and flavor. A fairly simple recipe is used and any pepper can be substituted. Once my sauce is made it is put into recycled hot sauce bottles. (I have a garage full) Several of my friends love to be ‘Guinea Pigs’ in my experiments. Not all of my creations are successes. One time the sauces fermented and blew the tops off and made a huge mess in the kitchen. 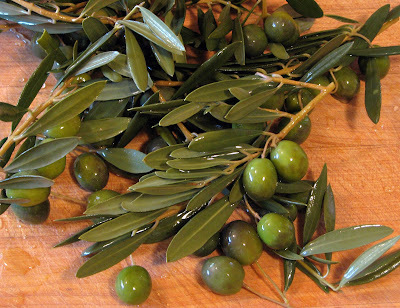 Today we are using a secret ingredient of some smoked olive oil. 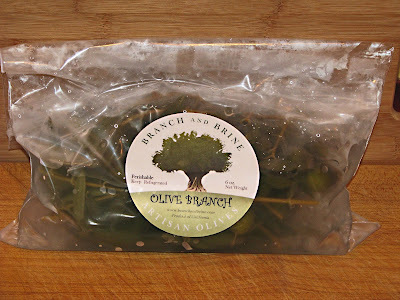 This unique product is created by the “The Smoked Olive”. Let’s go to the kitchen. Place all ingredients except smoked olive oil in a sauté pan. 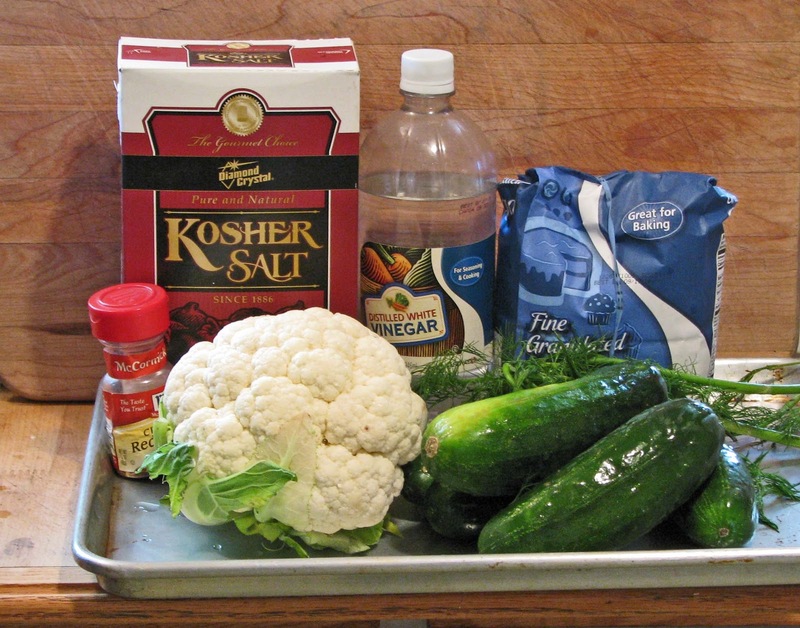 Bring to simmer and cook for 15 minutes or vegetables become soft. Let mixture cool slightly. 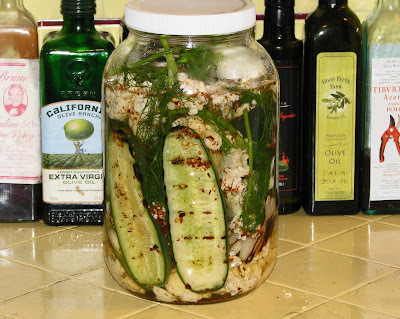 Place ingredients into food processor and add smoked olive oil. Puree mixture and add additional water to desired consistency. Let cool and place into bottles with a funnel. When cool refrigerate. Here is the million dollar question. Did it taste like carrots? There was a subtle carrot flavor that most likely came from the added carrot. This pepper flavor was mild that was not very unique. The pepper did meld well with the other ingredients. This sauce has a medium heat that warms your mouth with pepper bliss. The heat level tipped the meter 2 stars out of 5. 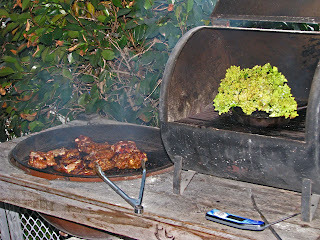 The smoked olive oil was an added bonus for adding a subtle smoke flavor. 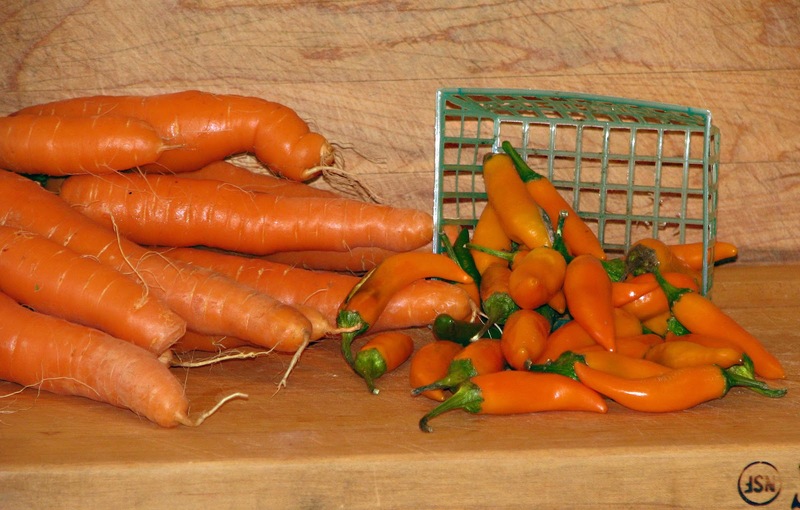 The Bulgarian carrot chile is thick skinned and full of seeds. This created a very thick sauce. This sauce worked well because of the balance and combination of ingredients. It is always fun to experiment with chiles. This recipe can be used with any chiles that you desire. Today’s Bulgarian Chile Hot Sauce was a success. It will not last very long. Berbere is an Ethiopian spice mix. We have it in a sauce form which can be used as a marinade or a dipping sauce. Our sauce comes from our friend Larry at Peppahead. He says his sauce is a pungent and fragrent African Blend with unique flavor. The ingredients are ‘berbere spice blend’, red wine vinegar, coconut milk, shallots, tomato paste, chiles and sea salt. This is a unique sauce. The smell is very complex. Cinnamon, cloves, vinegar, chiles are several aromas I detect. Larry says it is great as a marinade for lamb or chicken. 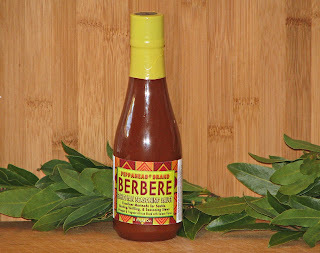 We are going to fire up the grill and try the berbere sauce with some chicken. 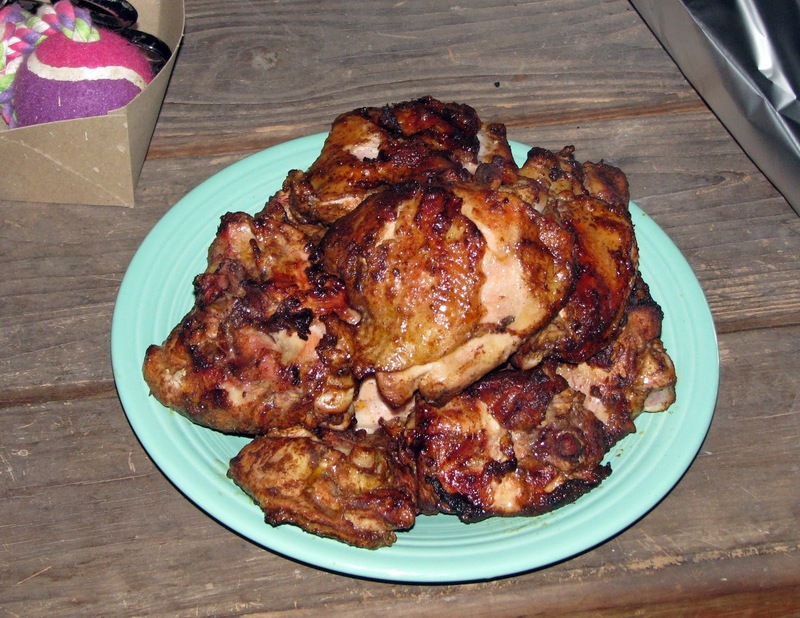 The sauce was slathered over some chicken thighs and put in the Chilebrown ice cave for several hours. 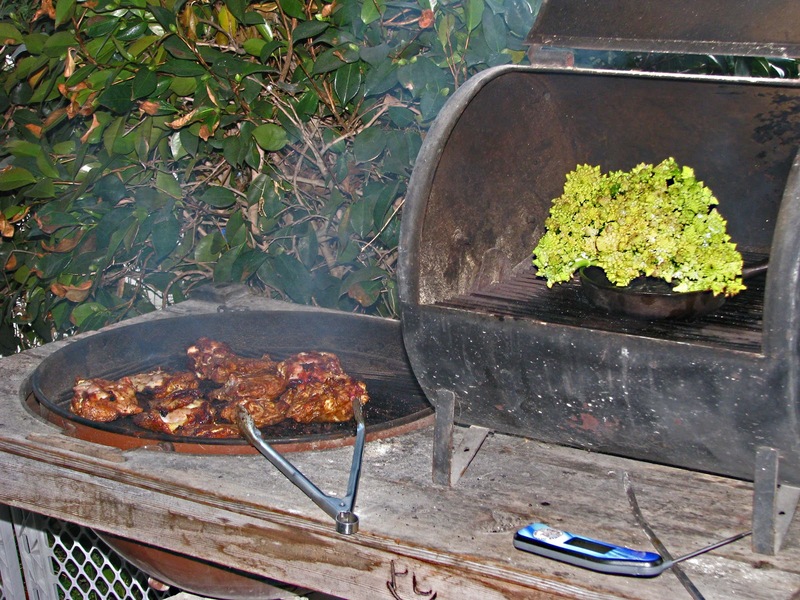 A medium mesquite charcoal fire was built in our old trusty and faithful Weber. We cooked the thighs with the vents closed half way and the cover on. We turned the chicken several times. When the thighs internal temperature reached 165 degrees we removed them and let them rest on a covered plate. The thighs were juicy and very flavorful. The key word tonight is unique. This was a flavor that was unfamiliar to our palate. Coconut milk, vinegar with a mix of pepper and spices created a slight heat and flavor that wreaked havoc with our Western tastes. Can you call it a curry? The spices had a slight earthy flavor. There were so many spices that may or may not be in this mix. Cinnamon, allspice, cloves, nutmeg, ginger and garlic is my guess. Did we like it? I liked it because of its unique flavor and slight heat. It is fun to experience new taste sensations. Ms. Goofy was not so impressed. If you would like to experience something that is a little exotic and different, it is available through Larry at Peppahead. 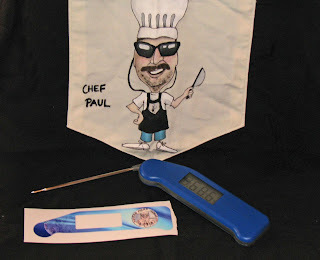 A thermometer is an essential tool for great cooking results on a grill, smoker or even your indoor stove/oven. The Cadillac Brougham model of thermometers is the Thermapen. It is lightning fast, accurate, and water resistant. 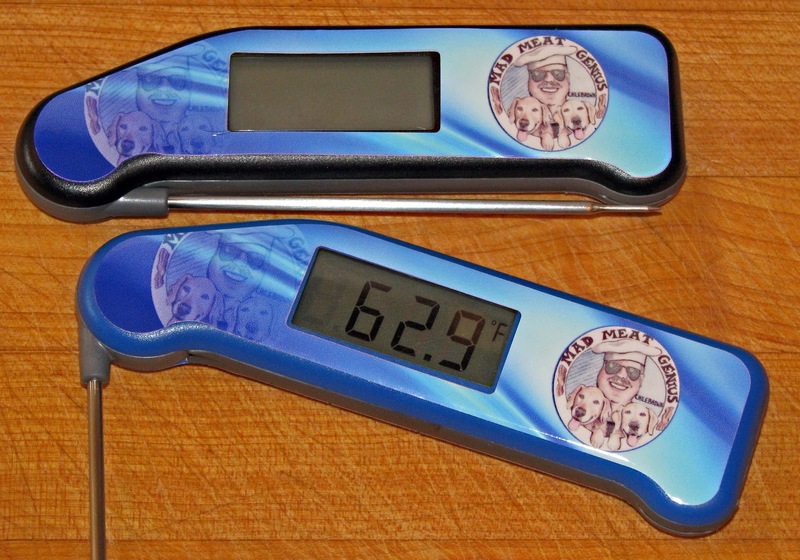 They come in various colors but sometimes a special limited edition model will come out with special logos or color designs.We have found a company, ThermaSkins that will customize your Thermapen with any design you can imagine. Now anybody can have their own special thermometer. A custom Mad Meat Genius Thermapen was born. This idea competes with sliced bread in my book. Download an image and ThermaSkin will create a decal that will perfectly fit your thermometer. Installation could not be simpler. Peal of the backing and carefully place decal on your thermometer. I cannot wait to show off my new essential cooking tool. What a perfect excuse to fire up the grill. We are mounting our horses and sauntering down to Tanya Holland’s cowboy themed BBQ restaurant ‘B-Side BBQ’. 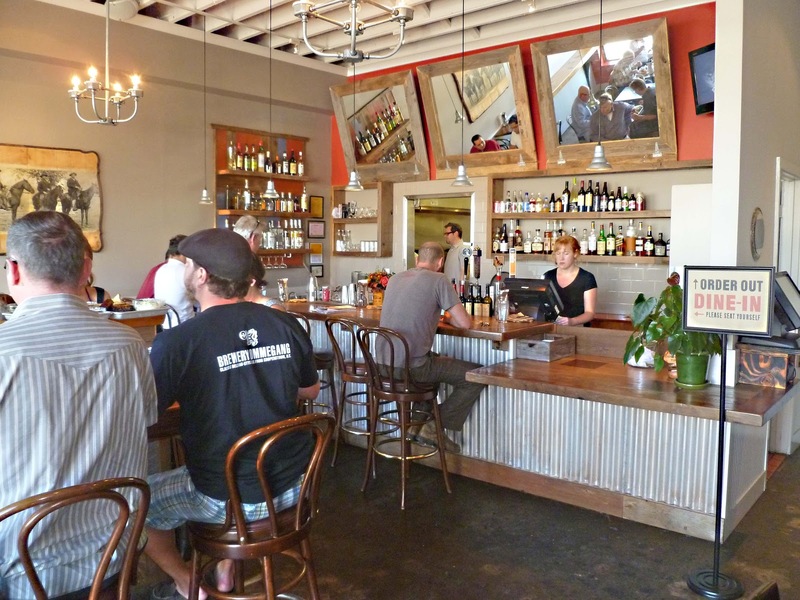 We are not sure our horses will be outside when we finish because this BBQ joint is located in the Wild West Oakland California. Thankfully we got a parking spot out front. Safely inside this small restaurant we were pleasantly greeted with a cowboy themed décor. 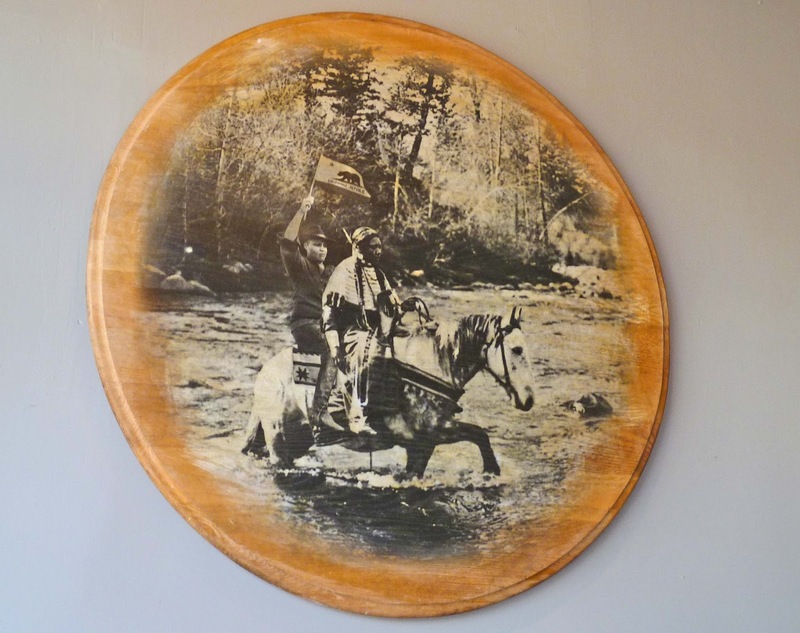 Tables that had brand markings were corralled by walls decorated with old west pictures. We lassoed a table and surveyed the menu. We made our choices and placed our orders. Guess who walked through the door and sat right next to us? Yes you are right, it was Narsai David. This would be a celebrity fueled lunch. The menu has the usual BBQ fair with meats and side dishes. 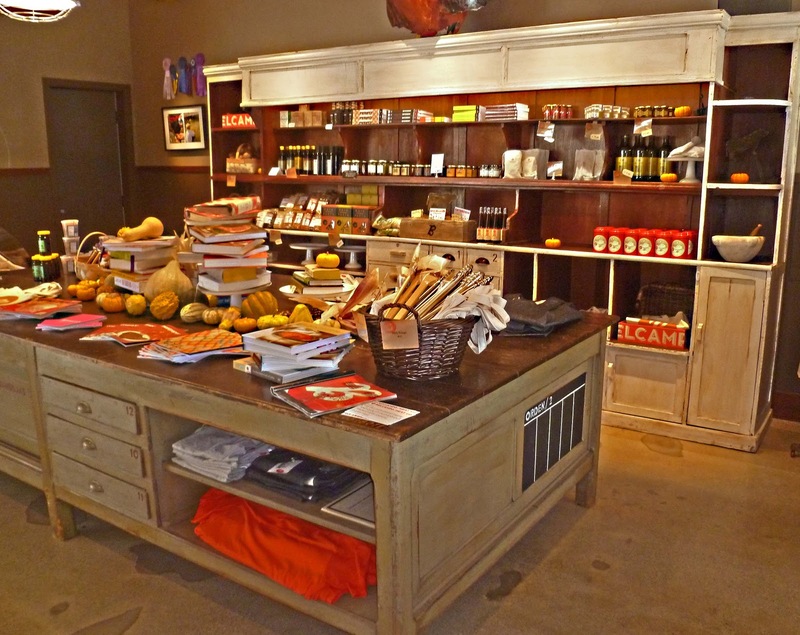 Everything is ordered separately and is priced on the high side. All dishes are accompanied by some pickled vegetables and some ‘Texas Toast’ that is made with ‘Acme Pain de Mie”. B-Side has a full bar and a good selection of micro beers to choose from. 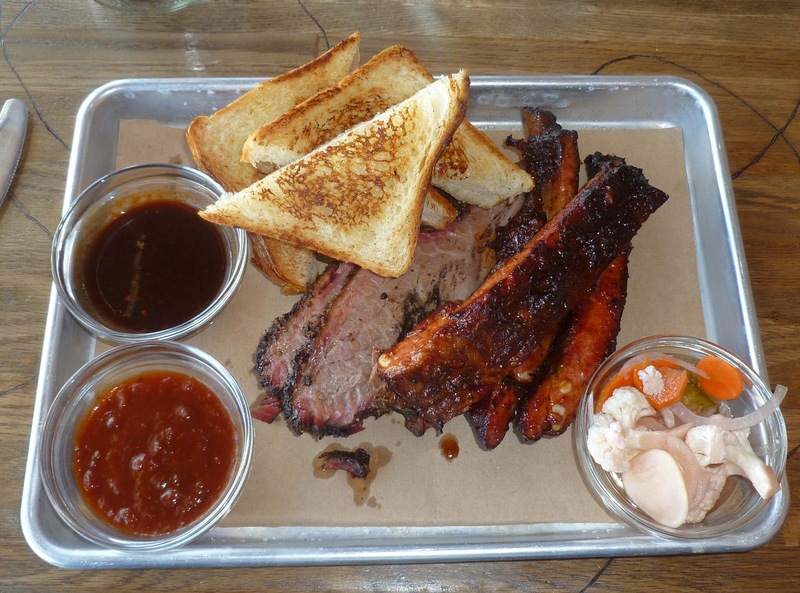 Most bbq restaurants offer a plate with a combination of meats so you can sample a variety of their offerings. This was not the case here so I ordered a plate of brown sugar rubbed brisket and a plate of ‘St. Louis Dark & Stormy’ ribs. Ms. Goofy ordered a pulled pork sandwich and a side of mac & cheese. Narsai ordered a few different plates and an appetizer of deep fired okra that he shared with us. Dark & Stormy St. Louis Style ribs were marinated with stout beer and ginger. The crust was flavorful and interesting. The actual meat was on the tough side and overcooked. It was served with a lackluster tomato based sauce. Enough of this not so flattering critique and on to the highlight of the meal; Brown Sugar rubbed brisket. This was some of the best brisket I have had in a long time. It was so tender it could be eaten with a fork. It had a dry rub that consisted of a paste of brown sugar and black pepper. This rub rocked the brisket to stardom. The pepper was not overpowering but complimenting the beefy flavor. Another star of this plate was the little side of pickled peppers. cauliflower, onions, peppers, and carrots in a sweet/tart vinegar was the perfect accompaniment to the rich brisket. Narsai’s deep fried okra did not impress. 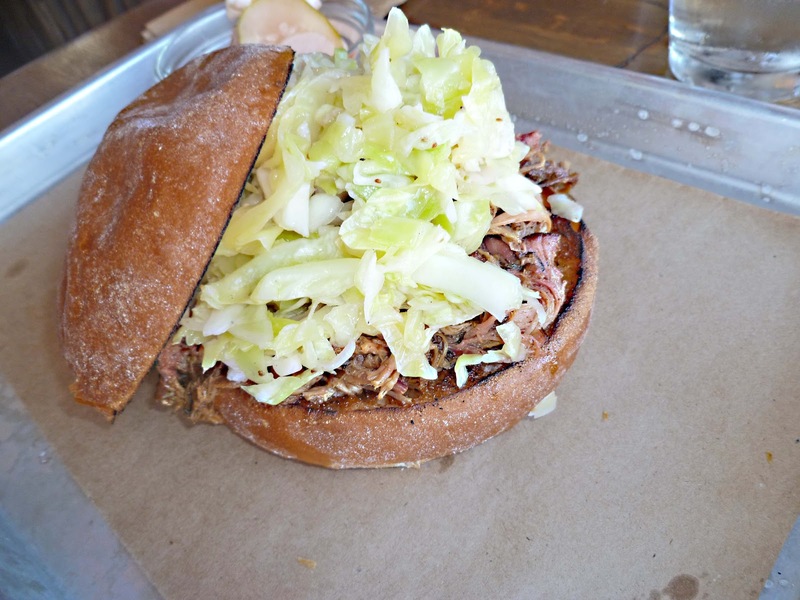 B-Side BBQ is a fun cowboy themed restaurant located in a challenged neighborhood. 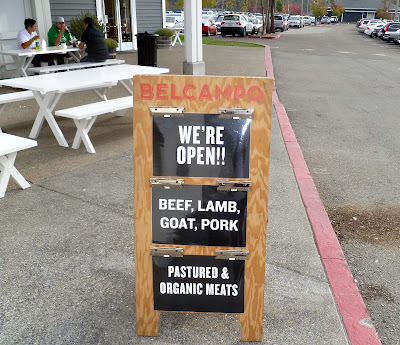 The brisket was impressive, the rest not. The food was visually stunning but did not live up to their appearance. There are too many other great BBQ joints in the Bay Area that I want to spend my money at. Narsai David did give us a lesson on proper bow tie’s. This vinegar is thick and syrupy. It smells of raisins and a wood barrel. Tonight we drizzled some over some strawberries. This vinegar is sweet and sour at the same time. 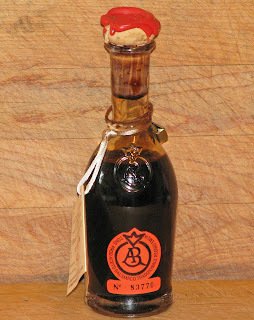 It does not have the acidic bite of newer vinegar Raisins with a slight vanilla flavor are my first impressions. 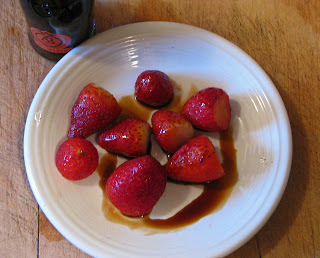 Ripe and flavorful strawberries are a good vehicle to showcase the special qualities of this vinegar. This is one special vinegar. Thanks Ms. Goofy. The San Francisco Giants have won the World Series. They were super hot and swept the Detroit Tigers in four games. It is an exciting time for baseball fans in the Bay Area. 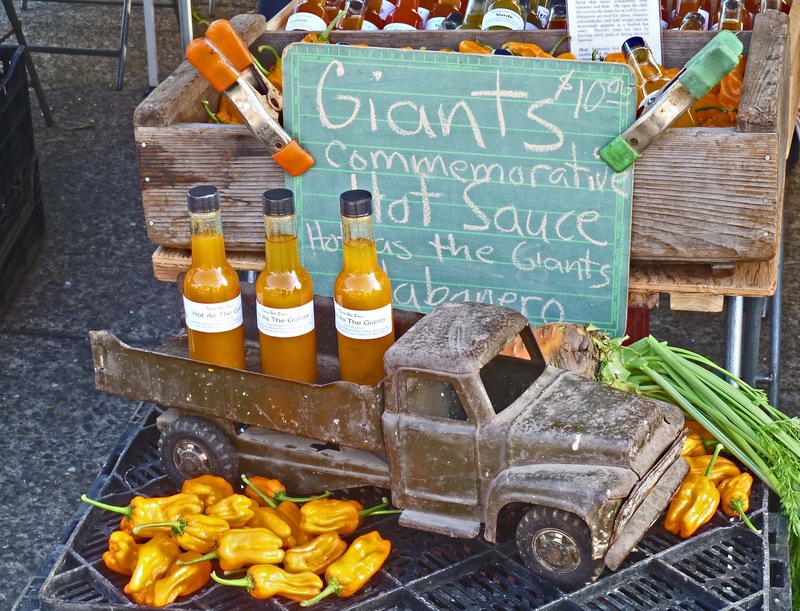 Everybody has ‘Giant’ fever including the farmers market. It has been hot literally in the Bay Area. The temperature today will reach seventy three degrees. Since everybody is hot and has Giants fervor it may be appropriate to try a commemorative hot sauce from ‘Tierra Farms’. 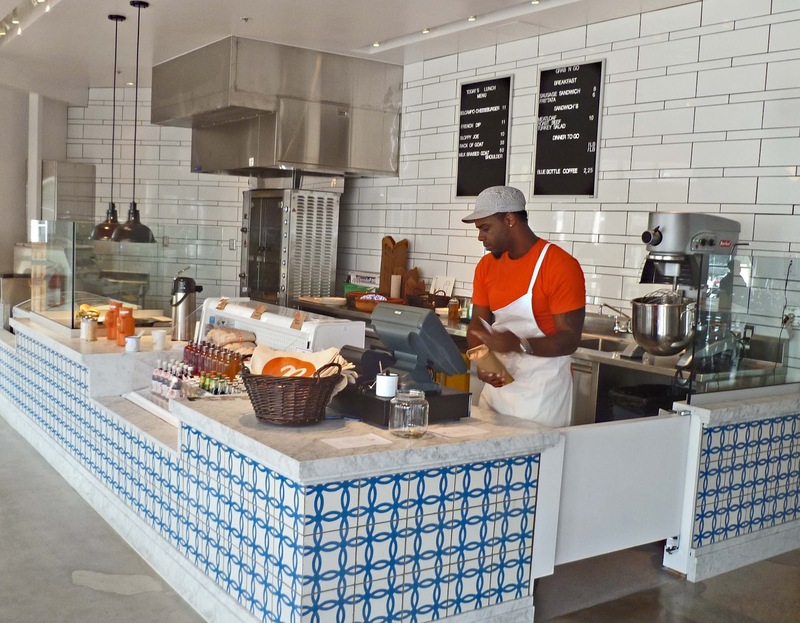 Tierra farm is located in Windsor California and sell their produce at the Ferry Plaza Farmers Market in San Francisco. 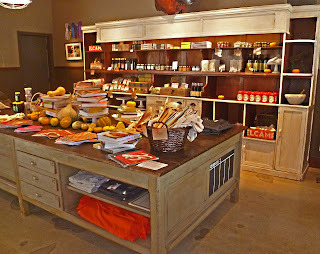 Tierra produces a number of quality and unique hot sauces. 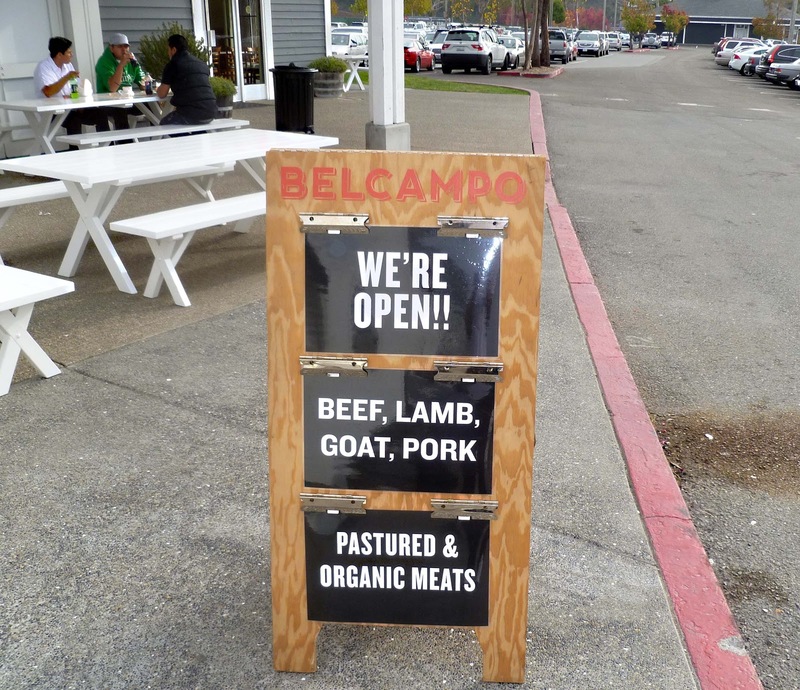 Their sauces are seasonal and created in small batches. Once a sauce is gone you will have to wait till next year. Today’s sauce is called “Hot As The Giants’. This is a sauce created with the ‘Jamaican Habanero’ pepper. 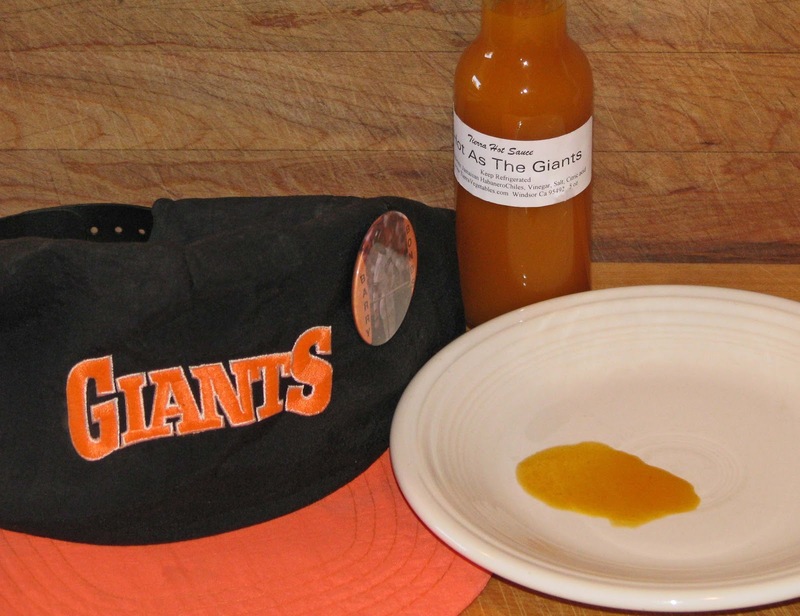 This bottle contains an orange sauce and is topped with a black cap which are the Giant’s team colors. We could not resist this purchase. The ingredient list is short and consists of; Jamaican Habanero Chiles, Vinegar, Salt, and citric acid. 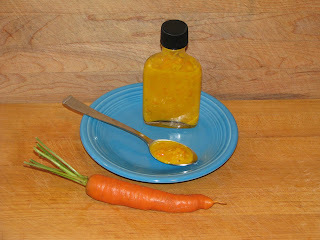 The minimal ingredients should showcase the flavor of the Jamaican Habanero pepper. It is a thin sauce that separates easily. The bottle needs to be shaken with each use. The sauce smells of habaneros and vinegar. The taste straight out of the bottle is of fruity citrus like pepper with a singeing kick in the behind that is delivered to your mouth. The vinegar enhances and compliments the peppers. The salt is present but not noticed to create a good balance. This sauce is not for novices. The heat level would be 3 stars out of 5. If you are a habanero lover the Jamaican peppers delivers. I personally love habaneros and thrive on the heat. This bottle will not last long because I will put it on everything. 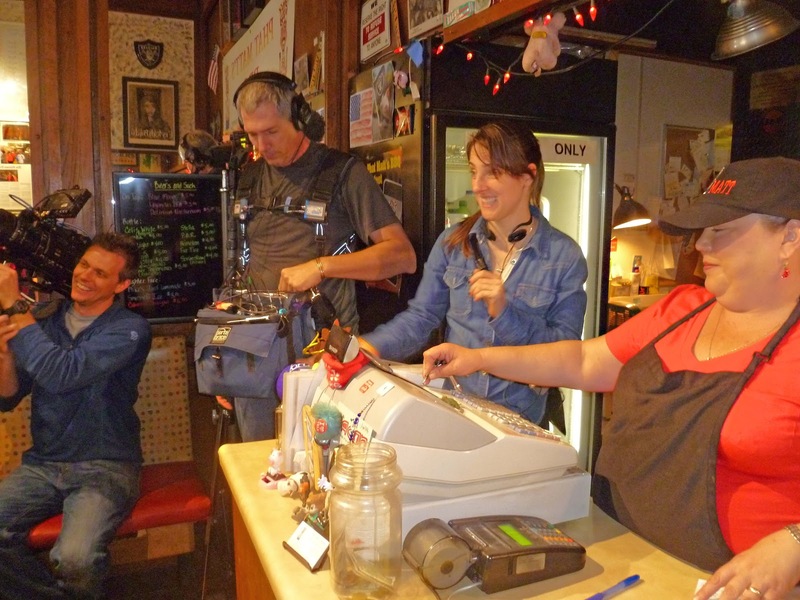 We got a heads up that the film crew from “United States of Food (Bacon)” would be filming at Phat Matt’s BBQ. 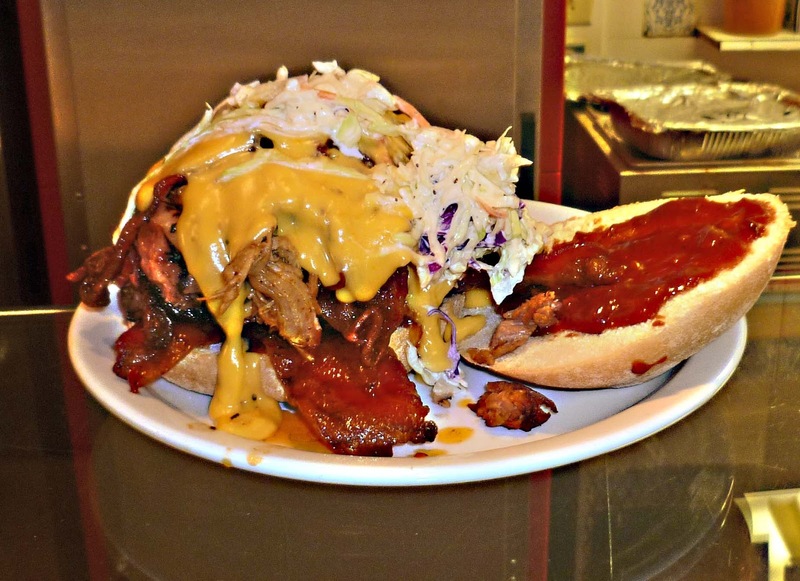 Phat Matt’s BBQ would also be showcasing, Charlotte & Matt’s favorite food, bacon. They called it Bacon Palooza. That’s all we needed to know. The Racing Honda might have set a land speed record traveling to our destination. 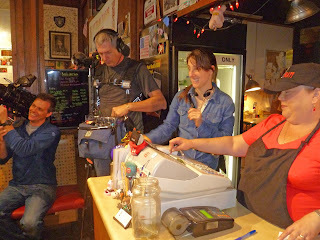 We arrived at Phat Matt’s to a brightly lit dining area fueled by television cameras and the smiles of bacon and barbeque enthusiasts. Destination America network has a series called ‘United States of Food”. This episode is called ‘United States of Bacon”. 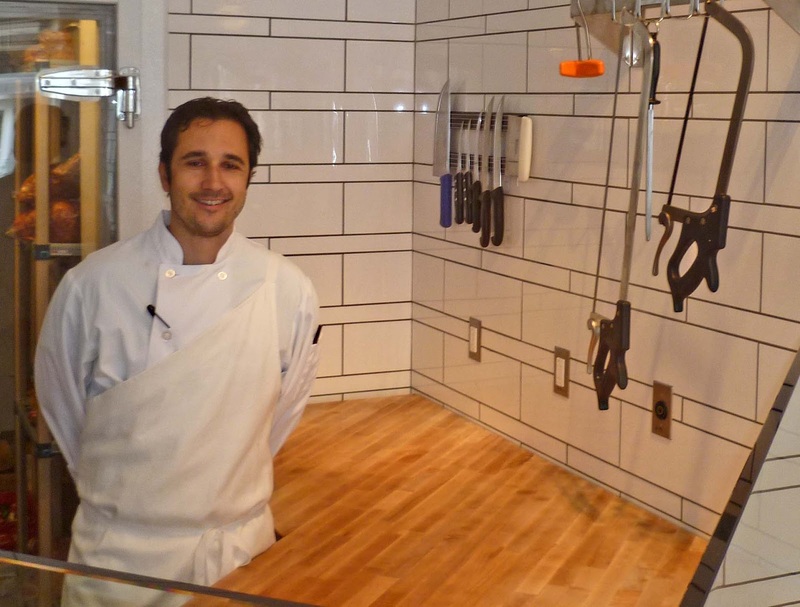 The host, Todd Fisher travels the country in search of unique and fun restaurants that showcase bacon. They chose Phat Matt’s because of Charlottes love of bacon. She frequently has specials that bacon is featured. Bacon maple pecan pie and chocolate covered bacon is always on the menu. 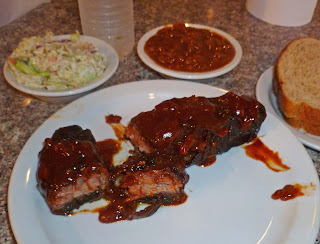 I also need to mention that Phat Matt’s serves some of the best barbeque around. We ordered some lunch. I could not resist the ‘Bacon wrapped Burnt Ends”. I have died and gone to BBQ heaven. Ms. Goofy had some mouth watering Tri-Tip. 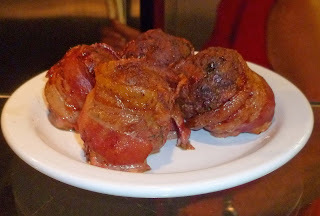 It was hard to not order the 'Phat Balls' ( bacon wrapped home made meatballs) or the infamous ‘Phat Bacon Beastie’. Phat Bacon Beastie is a combination of pulled pork, brisket, cheese, bbq sauce and of course bacon that is piled high to create a huge tower of a sandwich.We watched the filming as we ate. It was fun watching the filming of this television episode. Todd Fisher is a big ole ham bone of a personality. The producer saw us eating and approached us. She asked us if we would be interested in being interviewed. Ms. Goofy declined but of course yours truly could not resist. They wired me with a microphone and possible stardom began. Todd Fisher and I traded banter for several minutes. Who knows if our conversation will ever be aired? It will be up to the producer if I become cutting room floor fodder. What a great experience; Bacon, barbeque and Hollywood possibilities. This television episode will be shown late December. Until then I have my dreams.